Paris – The decade-long studio career of designer Guto Requena has mostly taken place in his native Brazil, where he’s created stools made from the extracted parameters of a samba song, projected data visualisation that ends up looking like faces and even pieces of kinetic architecture that dance along with pedestrians. Two of his recent projects, Sensitive Star and The Year, used complex interactive lighting to shake up the already sophisticated nightlife of São Paulo – and we were so impressed that we featured them on Night Fever 5, our survey of global hospitality design. We checked back with him after hearing about his first international commission, an insane arachnoid light installation for nightclub Terminal 7 in the French capital. How did it happen? ‘The client, a group that owns many bars, restaurants and clubs in Paris, got in touch with my work for the first time through the Night Fever book,’ he told us – and by the way, we’re working on Night Fever 6 and it’s currently open for submissions. We spoke with Requena about how his background — he’s a former club kid from the countryside of Brazil — and his hopes for parametric design came together in this project. Nightlife spaces are becoming increasingly competitive in terms of interior design. Did you take the photogenic qualities of the space into account for this proposal? Or did you approach it from a live, sensorial perspective? GUTO REQUENA: I’m a nightlife culture lover. I believe a good clubbing experience should invite us to escape, to dream, to forget about our problems. It should somehow be a lapse in space and time, to make us happy and to recharge our batteries. So I wanted a space with a strong visual identity, but with a lot of flexibility in order to create several experiences – from dinners to fashion shows to concerts and clubbing. That’s why the DJ booth and the concert stage can be positioned anywhere, allowing for different floor plans. That’s why I chose to do a light sculpture: it brings this flexibility to the space, working as a parametric grid. And then, inspired by the existing space itself, I tried to use it to frame and highlight the view of the Eiffel Tower. How do the lights behave when the space is in use? GR: Depending on the event, the rhizomatic grid can work differently. For example, during an elegant dinner it can turn into a huge chandelier with warm yellow light, but during a clubbing session the software that controls the lights uses the beats of the music as a major input for the visual effects. When the VJ is present, he can also play around with the mapping projection and the live dynamic effects. It’s just fascinating, seeing the infinite possibilities brought by new LED technology. I’ve been designing clubs and interactive installations in public spaces, and I’m obsessed with experimenting with this kind of projects – studying the emotional aspects brought along by new technologies. I believe light can form and shape unforgettable memories. Structurally, you explained that the sculpture is based on the shape of five trees. Why? GR: I am not interested anymore in drawing by hand to create shapes. I’m obsessed with ‘growing’ shapes using parametric design. So it’s me and the computer working together in symbiosis to generate forms. I’m from Sorocaba, in the countryside of the state of São Paulo. I grew up surrounded by nature, and one of my favourite things to do there was laying down under the trees. It was like a safe cabana where I could escape. I was somehow inspired by this idea: creating a field of trees connected by the tops, to shape an interactive grid or cabana that could hold inside the most amazing dance floor of all times. It was like an oneiric, escapist digital tribe. What was your research process like, both on the parametric and the sensorial side? GR: This project is part of my ongoing research of emotional hybrid spaces. I’m experimenting with digital technologies to shape new ways of creating sensible interaction, in order to stimulate empathy. As an activist for empathy, I will keep creating products and spaces using new digital technologies to stimulate affection. How have clubgoers reacted to it? GR: As a club kid myself, I can tell the space makes you go nuts! You can dance inside that electric forest like there’s no tomorrow. Many DJs – including my all-time fave, Ricardo Villalobos – go insane with the experience. 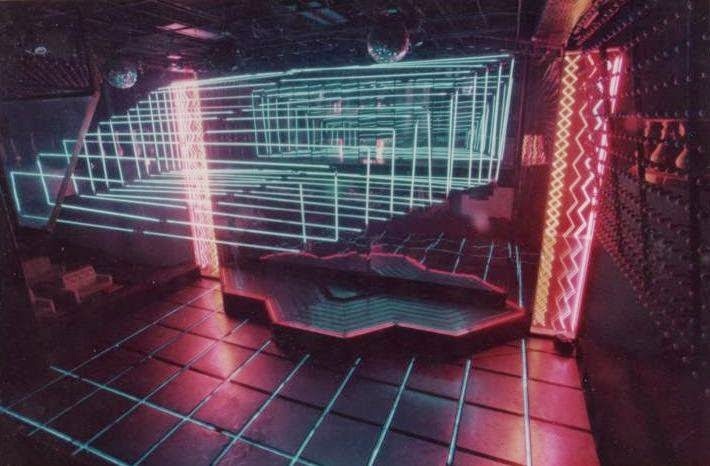 The setup of this project reminded me of a legendary 80s club in Mar del Plata, coincidentally called Symbiosis – Terminal 7 looks like an insane alien version of it. That club was a South American great fed on European influences, and now it seems that the influence is switching directions, with Brazil heading to France. GR: It indeed looks insane! I always try to bring my Latin American roots to my projects, and in this case, I went for some kind of nouveau digital-tropical.